2)	Kuhn JE.,Exercise in the treatment of rotator cuff impingement: a systematic review and a synthesized evidence-based rehabilitation protocol,J Shoulder Elbow Surg. 2009 Jan-Feb;18(1):138-60. 3)	Gartsman GM, Drake G, EdwardsTB, et al. Ultrasound evaluation of arthroscopic full-thickness supraspinatus rotator cuff repair: single-row versus double-row suture bridge (transosseous equivalent) fixation- results of a randomized, prospective study. Presented at the 2009 Closed Meeting of the American Shoulder and Elbow Surgeons; October 25,2009, New York, NY. 4)	Lo IK, Burkhart SS. Transtendon arthroscopic repair of partial thickness, articular surface tears of the rotator cuff. Arthroscopy. 2004; 20: 214-220. 5)	Arrigoni P, Brady PC, Burkhart SS. 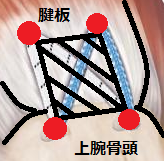 The double-pulley technique for double-row rotator cuff repair. Arthroscopy. 2007; 23: 675. e1-675.e4. 6)	Ross D,Rehabilitation Following Arthroscopic Rotator Cuff Repair:A Review of Current Literature,J Am Acad Orthop Surg. 2014 Jan;22(1):1-9. 7)	Keener JD,Rehabilitation following arthroscopic rotator cuff repair: a prospective randomized trial of immobilization compared with early motion.,J Bone Joint Surg Am. 2014 Jan 1;96(1):11-9.